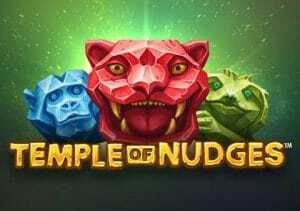 A lost jungle civilisation plays host to Temple of Nudges, a 5 reel, 243 ways to win video slot from Net Entertainment. Superbly designed as we’ve come to expect, you’ll also find reel nudges and streak re-spins in this simple but playable title. It’s available on PC, tablet and mobile with stakes starting at 25p rising up to £250 per spin for the super high rollers. Like most video slots in the NetEnt catalogue, plenty of effort has been put into making Temple of Nudges look and sound terrific. Set against a verdant jungle backdrop, the reels are set within a stone temple. The reels are made up of 4 lower value shape symbol and a quartet of higher paying carved animal heads. We say high paying but the number involved aren’t exactly massive. Landing 5 of the top paying red big cat will get you 0.36 times your total bet. Helping to boost those rather minimal looking payout amounts are the game’s 2 extras. Nudge feature – after every winning spin, the reels nudge down by one reel and a new payout calculation is made. If the newly nudged symbols create a new winner the process is repeated. The nudges keep on coming as long as there’s a winning combination on display somewhere on the reels. Re-Spin feature – joining the standard symbols is the re-spin symbol which can overlay on a winning spin. The successful symbols, plus any that match, are held and a new re-spin follows. A new payout consideration then follows. There aren’t any free spins or traditional features here. All of the action comes from the nudges and re-spins. The good news is that you can expect to see them land very regularly. That keeps the pace high and the cashier ticking over. The nature of the game engine means that things can quickly get quite repetitive. This won’t be a video slot for players who like plenty of variety from their features. Low variance, you can win 87.48 times your bet on each spin/re-spin/nudge. If you like simple action and classy sound and visuals, then you should find plenty to like in Temple of Nudges. Saying that, I think NetEnt has missed a trick as the win potential could be a lot higher. If you like the theme and want bigger wins, Gonzo’s Quest by NetEnt and Legend of the Jaguar from Playtech offer this.